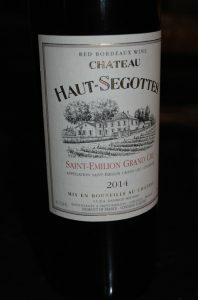 2014 Chateau Haut-Ségottes, Saint Emilion Grand Cru, Red Bordeaux, France. A highly entertaining wine and sleeper in this ho hum vintage, the Chateau Haut-Ségottes shows a classic and decedent array of dark fruit, loamy earth, bramble and a subtle chalkiness with layers of blackberry, plum, black cherry and mulberry fruit along with hints of cedar, anise, a faint green pepper and floral tones. There is a lot to like here and it’s Cabernet Franc based flavor profile adds to the intrigue and keeps this refined Bordeaux from being much the same to an ever growing list of generic offerings from the Saint-Emilion area that these days, while well made, all seem a touch overly ripe, over oaked and lacking of individual charm. This deep garnet hued 2014 Haut-Ségottes gets better and better in the glass adding a touch of currant and mineral along with bit of black olive, which add to the complexity here in a medium full bodied wine that is much more old school in style that most of its contemporaries and frankly make it more interesting. The Chateau Haut Ségottes is owned and operated by Danielle Meunier and her team and is well admired for the estate’s right bank wines that are Merlot and Cabernet Franc based. In 1972 Madame Meunier took the reins of production, becoming as her importers notes a “vigneronne extraordinaire”, she is the fourth generation of her family to oversee this nine hectare estate situated in the heart of the Saint Emilion appellation, and Mme. Meunier’s great-grandfather purchased the estate around 1860 and had earned gold medals for his wine as early as 1912 at the Concours Agricole in Paris. Sitting right next to the fabled Chaval Blanc and the highly regarded Plateau de Corbin, Chateau Haut Ségottes obviously sits on amazing terroir with it’s underpinning of limestone and clay soils with vines that are planted to about 60% Merlot, 35% Cabernet Franc and close to 5% Cabernet Sauvignon which form the base of this Chateau’s wines. Noted for her obsessive attention to detail and care in both her vineyards and in the cave (cellar) the wines are beautiful reflective of this with transparency and ultra clean and soil based personality. The wonderfully pure and lightly spicy 2014 Chateau Haut-Ségottes, is a rich, without heaviness, in fact it is pretty and compelling now for a wine that, while youthful, seems comfortable to be opened now, as it is drinking well with its lovely dark fruits shining intensely. The primary fermentation takes place in cuve, before being racked to barrel, 20% new oak and is bottled unfiltered. Although the majority of the vineyards are planted to Merlot (see above), the final cuvée bottled as Chateau Haut-Segottes is a Cabernet Franc dominated blend, usually about 65% Franc, that sees 18 months in barrel. There is no question the 2015 and 2016 will have a more flamboyant nature given the vintages’ greatness and density, but it would be ashamed to overlook a fine effort like this one, especially in the form it is in right now, this 2014 Haut-Ségottes is really good.